Technologies such as cloud-based computing and mobile communication are creating a new generation of advanced services, more empowered workers and improving productivity, flexibility and safety. That is why leading power and automation group ABB has extended its general purpose ACS580 variable speed drives offering with smart phone apps for advanced services. The company’s ACS580 offering, which includes plug-in simplicity, protection options for harsh environments and connectivity, will be extended to new power range with new drive modules for cabinet installations, complementing the wall-mounted drives offering for IP21 and IP55 protection classes. “The ACS580 drive module range supplies 250 to 500 kW of power in a 380 to 480 V voltage range. The new drive modules for cabinet installations complement ABB’s wall-mounted drives offering which is available with IP21 and IP55 protection class cabinets for harsh operating environments. The drive modules feature a robust IP00 enclosure with coated circuit boards as standard for improved reliability,” reads the press release by ABB. Featuring an advanced pedestal system and a ramp for quick and easy installation, the ACS580 is plug-in ready to control a variety of pumps, compressors, fans, conveyors, mixers and other variable and basic constant-torque applications. Some of the built-in features of the ACS580 drive module include an integrated EMC class C3 filter and common mode filter as standard, a Modbus RTU fieldbus interface and a dual-channel safe torque off with SIL 3 PL e.
“As all the essential features are built into the drive module as standard, the need for external components, extra cabling and space requirements is reduced to minimum. This makes drive selection and use easy, and gives users better management of energy use and savings,” ABB said in the press release. The module has a robust and protective design which is perfectly suited for applications exposed to dust, moisture, vibrations, and other harsh environments. Further, the ACS580 improves energy efficiency and reduces operating wear without the need of additional external programmable logic controllers. The drives also support connectivity to mobile applications with built-in features. 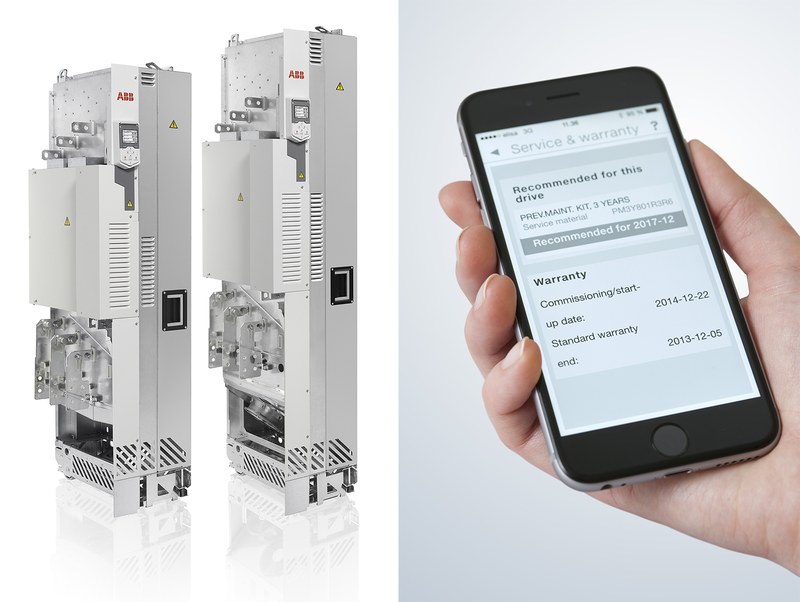 Customers can register and access their installed drive base, ABB contact details, user documentation and service recommendations via ABB’s Drivebase – a mobile application for AC drives. “ABB’s drives have the ability to create a QR code on the control panel screen with information such as serial number, firmware version, user modified parameters, fault history as well as status and diagnostics data. By scanning the QR code with a smart phone, users receive error code descriptions and recommendations on how to troubleshoot the drive through the Drivebase app,” it says in the press release. Integrated Bluetooth technology between the drive and a mobile device allows users to monitor and control the drive on the go, giving them access to cloud-based services and information through an intuitive touch-screen app with visualisations. Using their mobile devices, users can manage their drive-base, analyse service needs, quickly solve possible issues and utilise other applications.